This is a very versatile vegetable and herb. Most parts of the plant are edible, including: leaves, stems (bulbs), seeds, and flowers; all have a licorice flavor. This recipe is adapted from Henriette’s Herbal website, originally from the Moosewood Cookbook. Potatoes: You can leave the peels on, or remove them, your choice. Slice into thin pieces 1-2″ long. Keep in cold water with 1 Tbsp lemon juice until ready to use. 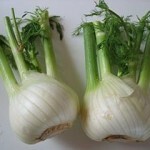 Fennel: Cut off some feathery tips of the fennel and set aside. 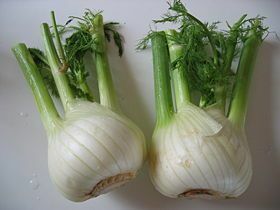 Cut off the green stalks from the fennel bulb, and save for another use. Remove each white layer of the bulb from the core, and wash well. Then mince or slice crosswise, very thinly, enough to make 1 cup (or more, to taste), and set aside. Onion: Remove papery outer layers of onion, then slice thinly in rings. Set aside. Soup: Heat butter/oil in stock pot or Dutch oven. Add sliced onions and 1 tsp salt. Cook over medium-low heat, stirring occasionally, about 15 – 20 minutes, or until onions are very, very soft and lightly browned. Add minced fennel, caraway seeds, and another ½ tsp salt. Saute over medium heat for another 5 minute, then add the water or stock, and potatoes. Bring to a boil, then partially cover, and simmer until potatoes are tender, about 10 minutes. Adjust seasoning with more sea salt and white pepper as desired. Serve, alone, or with optional toppings (below). feathery tops of fennel, well minced, sprinkled over. This entry was posted in Fat or oil, Herbs, Leafy Veggie, Nuts and seeds, Onion family, Root Veggie, Sauteed, Simmered, Stock, broth and tagged caraway, fennel bulb, onion, potato. Bookmark the permalink.